Find Your 2019 Duck Camp Here! Over the last 17 years the cornerstones of our success at Prairie Smoke Ranch have stayed the same – safe, clean, comfortable accommodations, exclusive on-site access to our acreage, and furthering the traditions of hunting, dog work and the pursuit of game with respect and admiration. Our birds are all wild, as is the landscape and our waterways where the birds were hatched and fledged. This is hunting – the way you remember it. We are located in the hills of the Missouri (River) Coteau, in North Dakota Prairie Pothole country--simply the last best place for duck hunting in the Northern Plains. You will NOT harvest a greater variety of waterfowl anywhere in North America than right here at Prairie Smoke Ranch. As many as 13 different species have arrived in the cleaning shed after a single morning's hunt. Come join us, bring friends and a dog or two and make some memories. "I am so glad to have found Prairie Smoke Ranch! Me and my hunting buddies make a trip to the prairie pothole region of North Dakota every year to hunt waterfowl and upland birds. PSR is situated perfectly in the heart of area and is prime for any type hunting you want to do. 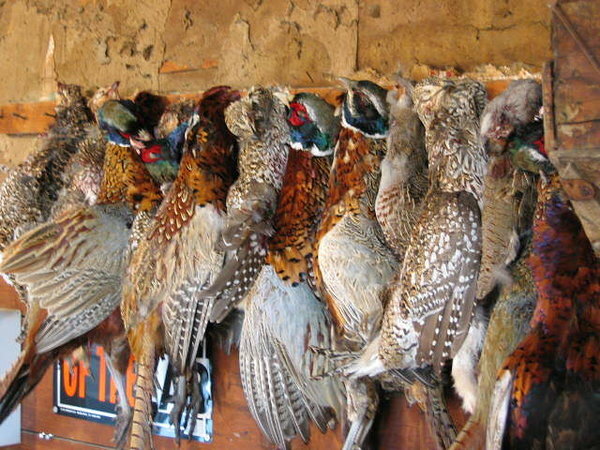 On the ranch, we’ve had great success with waterfowl, pheasant, and sharp tail grouse. The whole property is easy to access with your truck or 4 wheeler so it is easy to hunt and get around. And if you want variety, there are plenty of opportunities in close driving distance off property that hold tons of birds. The amenities on site are perfect for hunters! Nice bunkhouses with kitchens, the house has a good bathroom with shower and mud room for your gear. The cleaning shed has everything you need to process your game and preserve it for the trip home. PSR is the only place in the area we consider each year!" Our 870 rolling acres contain lakes and wetlands ranging in size from 1 to 60 acres. Prairie Smoke Ranch is a family-owned working ranch managed for waterfowl and upland game production. At last count we attracted 17 species of ducks, snow, Canada and whitefront geese, tundra swans, sandhill cranes, doves, ring-necked pheasants, sharptail grouse, Hungarian partridge, white-tailed and mule deer (plus the occasional moose and elk). Dozens of non-game species also call the ranch home. North America than right here at Prairie Smoke Ranch." Excerpt from this issue of the Prairie Pothole Journal: " The friend in the non-resident's corner is the owner of the local gas station, bait shop, motel or small town diner -- those folks who depend on your patronage each fall to survive."